Transportation magazine - in-house Goodyear magazine from 1951. Homepage. This page: A magazine aimed at operators and drivers of commercial vehicles in the early post-war years. Driving any vehicle after the war wasn't always a straightforward task, due to post-war shortages and rationing. Operators and drivers of commercial vehicles had it especially tough, often having to use old and worn-out lorries from pre-war times due to the shortage of new vehicles that were available to many businesses. 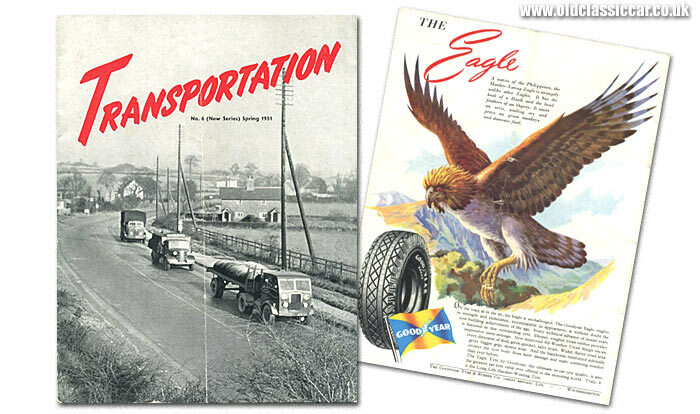 This magazine, produced by the Goodyear Tyre and Rubber Company (Great Britain) Limited, was aimed at commercial vehicle operators. The magazine shown below was issue number 6 of the post-war run, the first of which was printed late in 1949. This issue dates to Spring 1951, and features three hard-working lorries on its cover - the first lorry I've yet to identify, but the second is an Austin K2, followed by a Commer. The introduction to the magazine makes reference to the shortage of paper that was available, commenting that they'd easily be able to increase circulation if only more stocks of paper were available to them. The magazine was produced and issued to users who had an interest in Goodyear tyres, both in the UK, the Commonwealth and in other foreign climes, offering a forum whereby drivers and vehicle owners could share problems, ideas and also discuss new product developments. The first article in Transportation looks at one of the best known haulage firms, Wynn's, who'd been in the heavy haulage business for eighty years by 1951. Wynn's was founded in 1863. Thomas Wynn recognised that the railways had taken over from horse-drawn transport in the haulage of goods over long distances, but that at either end of the journey there was still a requirement for horse-drawn transportation, to deliver goods from the railways to warehouses and factories relying on those products. The movement of boilers, cranes, steam engines and other outsized loads would soon become regular jobs for the Wynn's crews with, by the turn of the century, a stable of some one hundred horses being used in the course of their business. In 1903 Wynn's bought their first steam traction engine, enabling them to haul yet greater loads while the horses continued to be used on local contracts. The year 1910 saw the firm invest in their first petrol-driven vehicle, the first of many. In the late 1930s there was a great increase in the building of new factories in South Wales, which led to an increase in the need for services such as those offered by Wynn's. The Second World War saw vast numbers of munitions produced in South Wales being distributed around the country, and business continued to thrive once hostilities had ceased and attentions switched to the rebuilding of our towns and cities. Photographs showing a steam locomotive being delivered to the Festival of Britain site, and an ex-military Diamond T lorry delivering equipment to a power station, illustrate typical loads that the firm was called on to deliver. As this was a magazine produced by Goodyear, it goes without saying that many of the article focus on their products. 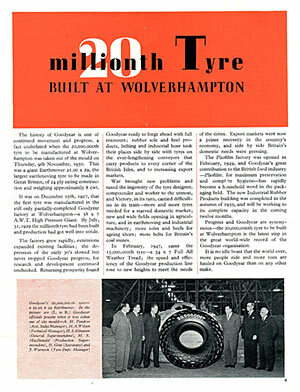 Page number four celebrates the 20,000,000th tyre to be produced at their Wolverhampton base. A hefty 21.00 x 29 Earthmover tyre, it stood as tall as the Goodyear officials who were photographed alongside it. The first tyre at this factory was manufactured on December 15th 1927, before the factory had even been finished. Apparently it was a 38 x 7 A.W.T. High Pressure Giant. Production of motor vehicle tyres soon ramped up, with the one millionth tyre rolling out of the door in July 1929, less than two years after production commenced. Echoing the fact that the magazine was aimed at commercial operators rather than private motorists, the next article looks at the new workshops being constructed by The Birmingham & Midland Omnibus Co. Ltd, or "Midland Red", at Carlisle Road in Edgbaston. Their fleet of vehicles numbered 1,800 in strength, with 600 of these scheduled for major overhaul in a typical 12-month period. Different workshops had been established to cater for each area of maintenance, the Body and Paint Shop for instance was capable of handling 50 vehicles at any one time. Tips on tyre maintenance occupy the centre pages of the magazine, while advice on choosing the best Goodyear tyres for your needs is also given - models in their range included A.W.T., Stop Start, Ribbed, Sure Grip, and Type "S". An article discussing the technology involved in manufacturing giant earthmover tyres is also included, the development of which raced ahead during the war thanks to the requirements placed on tyres by the armed forces, and the inhospitable environments that their vehicles - both in the air and on land - were subjected to. The back page introduces the reader to developments that this tyre maker was making in the field of road safety. Trials had taken place at a disused bomber base, whereby cars fitted with Lifeguard Safety Tubes (inner tubes) were subjected to rapid deflation in one tyre. Two situations were demonstrated. The first saw an explosive being placed within the offside front tyre, the second saw a car driven over a bed of 4" spikes. The tyre bursts were undertaken at 30 and then 60mph, in all cases the car (a Ford V8 Pilot is shown being driven over a bed of nails) slowed down with neither weave nor wobble. Did they ever end up on sale to the public? The firm is still very much in business obviously, but for how long was "Transportation" magazine produced? and what if anything replaced it? Return to the car & transport magazines section.